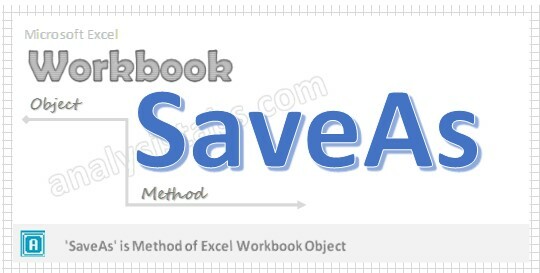 We can save workbook by using ‘SaveAs’ method of workbook object in Excel VBA. Please find the following brief description about saveas method of workbook object. Why we need to SaveAS a Workbook using VBA? When we do any changes in the existing workbook, later we may wanted to see the file without changes. So that we can saves changes to the workbook in a different file using ‘SaveAs’ method of workbook object. Here is the syntax to SaveAs workbook using VBA. In the above syntax we are using ‘SaveAs’ method of workbook object to save the workbook in another location with modification(s). Please find the below example, It will show you how to do saveas workbook. Explanation: In the above example we have created variable named Wkb in the first statement. We have used ‘Add’ method of workbook object to add new workbook and then assigned it to object named Wkb in the second statement. At last in the third statement we have used ‘SaveAs’ method of workbook object to save workbook in another location and the file name is “C:\Sample.xlsm” (You can change the file name according to your wish). with a SaveAs function. I need it becuase I am trying to create a Macro where I need to open a file that is not always named in the same way, have the macro save it with a standard name, for example: Test Sample, and have the macro work on it. The Macro should take the infomartion needed from this file and report it on the main file where the Macro is running. Finally the Macro should delete the “Test Sample” file and save the file where the Macro is running with a new name. I hope this makes sense enough for you to understand what I am struggling with!